We studied adaptive evolution of gene expression using long-term experimental evolution of Saccharomyces cerevisiae in ammonium-limited chemostats. We found repeated selection for non-synonymous variation in the DNA binding domain of the transcriptional activator, GAT1, which functions with the repressor, DAL80 in an incoherent type-1 feedforward loop (I1-FFL) to control expression of the high affinity ammonium transporter gene, MEP2. Missense mutations in the DNA binding domain of GAT1 reduce its binding to the GATAA consensus sequence. However, we show experimentally, and using mathematical modeling, that decreases in GAT1 binding result in increased expression of MEP2 as a consequence of properties of I1-FFLs. Our results show that I1-FFLs, one of the most commonly occurring network motifs in transcriptional networks, can facilitate adaptive tuning of gene expression through modulation of transcription factor binding affinities. Our findings highlight the importance of gene regulatory architectures in the evolution of gene expression. Gene expression evolution is a pervasive source of phenotypic diversity between and within species (Jacob and Monod, 1961; Jacob, 1977; Nocedal and Johnson, 2015). Genetic variation causing evolutionary changes in gene expression impacts either the regulatory elements of a gene (cis-regulatory) or the factors that control its expression (trans-regulatory). The relative importance of these two classes of variation across evolutionary timescales is the source of long-standing debate (Wittkopp et al., 2004; Hoekstra and Coyne, 2007; Stern and Orgogozo, 2008; Soskine and Tawfik, 2010). A variety of approaches have been developed for identifying the genetic basis of intraspecific gene expression variation (Brem et al., 2002; Yvert et al., 2003) and defining the landscape of mutational changes that affect gene expression (Metzger et al., 2016). Comparative genomics using extant organisms is typically used for inferring the evolutionary processes and outcomes that underlie the evolution of gene expression (Wittkopp, 2010). However, these approaches face the challenge of distinguishing neutral from adaptive variation and cannot provide insights into the dynamics of gene expression evolution in evolving populations. The regulation of gene expression typically comprises multiple regulatory factors with both activating and repressive functions that coordinately control the dynamics and output of gene transcription. Regulatory networks controlling gene expression are composed of network motifs, recurrently occurring patterns of interaction between regulatory factors (Alon, 2007). Studies of global regulatory networks in Escherichia coli (Shen-Orr et al., 2002) and Saccharomyces cerevisiae (Lee et al., 2002) identified three component feed-forward loops (FFL) as one of the most commonly occurring network motifs. A FFL comprises a transcription factor that regulates a second transcription factor. Both transcription factors bind the regulatory region of a third target gene and jointly control its expression. As transcription factors can be either activators or repressors, there are eight possible configurations of three component FFLs (Mangan and Alon, 2003). Of these variants, incoherent type-1 feed-forward loops (I1-FFL) are one of the most common, occurring hundreds of times in bacteria and yeast gene regulatory networks (Lee et al., 2002; Mangan and Alon, 2003; Milo et al., 2002). These network motifs are termed ‘incoherent’ as the upstream regulator directly activates the target gene and indirectly represses it by activating a repressor of the target gene. I1-FFL function to speed the response time of gene expression (Mangan and Alon, 2003) and for particular parameter values, detect relative changes in input signals rather than absolute levels of inputs (Goentoro et al., 2009). 1I-FFLs are found throughout gene regulatory networks in multiple organisms. Although the dynamic properties and behavior of the I1-FFL have been extensively studied, the significance of this network in evolution is not well understood. In particular, how I1-FFLs constrain or facilitate evolutionary pathways remains unknown. Long-term experimental evolution (LTEE) provides a means of studying evolutionary dynamics, processes and outcomes. Performing replicated LTEE in controlled conditions and assessing the fitness and phenotypes of evolved lineages and populations enables tests of the role of gene expression evolution in response to selection and the extent to which selection results in recurrent outcomes. LTEE in microorganisms provides evidence for the role of adaptive changes in gene expression in response to selection as parallel changes in gene expression have been observed in replicated populations of both E. coli (Cooper et al., 2003) and S. cerevisiae (Ferea et al., 1999; Gresham et al., 2008). However, proving that changes in gene expression are adaptive and identifying the underlying molecular bases of gene expression changes acquired during experimental evolution remains challenging. Quantitative DNA sequencing enables the comprehensive identification of genomic variants, their frequencies and dynamics during adaptive evolution (Gresham et al., 2008; Kao and Sherlock, 2008; Wenger et al., 2011; Hong and Gresham, 2014). In LTEE performed in conditions of constant nutrient-limitation using chemostats, increased expression of nutrient transporter genes is a primary mode of adaptive evolution (Gresham and Hong, 2015). Copy number variants (CNVs), comprising gene amplifications that result in increased expression of transporter genes (Gresham et al., 2008; Hong and Gresham, 2014), are a recurrent class of adaptive alleles in chemostat LTEE. However, adaptive mutations in trans factors, such as transcription factors (TFs) are also frequently identified in LTEEs (Kao and Sherlock, 2008; Hong and Gresham, 2014). These variant alleles are primarily missense, frame-shift or nonsense mutations that are likely to confer strong effects on gene expression in evolved lineages (Wray, 2007; Carroll, 2008). However, how protein coding changes in transcriptional regulators identified during LTEE alter gene expression and how these changes in expression confer increased fitness remains unknown. The regulation of nitrogen utilization in budding yeast represents one of the best understood gene regulatory networks in any system. Control of nitrogen catabolite repression (NCR) transcription is achieved by four transcription factors, that bind to the same GATAA consensus sequence (Cooper, 2002; Magasanik and Kaiser, 2002; Hofman-Bang, 1999). Two factors – GLN3 and GAT1 – have activating activity and two factors – DAL80 and GZF3 – have repressive activity. GLN3 is constitutively expressed and regulated post-translationally by TORC1-dependent phosphorylation that prevents its entry into the nucleus. In conditions in which TORC1 activity is low, dephosphorylation of GLN3 enables it to enter the nucleus where it activates expression of GAT1, DAL80 and GZF3 (Figure 1—figure supplement 1). The promoters of GAT1, DAL80 and GZF3 contain GATAA binding sites and thus they coordinately regulate expression of their targets and themselves. The NCR regulatory components comprise four interconnected I1-FFLs comprising either of the activators, GLN3 and GAT1, and either of the repressors DAL80 or GZF3, that function to regulate the expression dynamics and output of ~41 target genes (Godard et al., 2007) that encode products required for assimilating diverse nitrogen sources. NCR is an ideal system for studying the evolution of gene expression owing to the well-characterized properties of its four regulators and the small number of well-defined direct targets. Here, we used LTEE in ammonium-limited chemostats to investigate the functional basis of adaptive increases in gene expression. Leveraging our understanding of selection in chemostats primarily operating on nutrient transport (Gresham and Hong, 2015) and the detailed understanding of nitrogen-regulated gene expression in yeast (Cooper, 2002; Magasanik and Kaiser, 2002) we studied how adaptive variation in the trans regulatory factor, GAT1, mediates its effects on fitness by altering gene expression. We find that the beneficial effects of recurrently selected missense mutations in GAT1 are a result of its effect on increasing expression of the high affinity ammonium transporter gene, MEP2. Surprisingly, we find that these effects are the result of decreased affinity for the GAT1 consensus binding site that differentially impact binding at the promoters of the repressor DAL80 and their common transcriptional target, MEP2. Using functional assays and mathematical modeling we find that adaptive evolution acts to increase the transcriptional output from the I1-FFL comprising GAT1, DAL80 and MEP2 by decreasing transcription factor affinities. Thus, in addition to their important dynamic behavior, I1-FFL possess properties that may be exploited by evolution to tune their output thereby increasing organismal fitness. Previously, we identified repeated selection of independent missense mutations in the DNA binding domain of GAT1 within a single LTEE population maintained in ammonium-limited chemostats (Hong and Gresham, 2014). In this study, we aimed to determine whether adaptive mutations in GAT1 result in alteration of its regulatory activities and, if so, how these changes impact fitness. First, we tested the repeatability of adaptive GAT1 mutations in initially clonal populations maintained in ammonium-limited environments by performing LTEE in triplicate using asexually reproducing populations in ammonium-limited chemostats (Figure 1a). We found that evolution is highly parallel both at the phenotypic and genotypic levels over 250 generations. We observed significant increases in population level fitness with an overall deceleration in the rate of fitness improvement with time as seen in previous LTEEs (Barrick et al., 2009) (Figure 1b). Using whole genome, whole population sequencing of evolving populations, we identified recurrent selection for missense mutations in the DNA binding domain of GAT1 during the early stages of adaptive evolution in each population. Consistent with positive selection for increased ammonium transport capacity in this environment, we also identified CNVs that include MEP2, which encodes a high-affinity ammonium transporter, at high frequencies following 250 generations of selection (Figure 1c). Repeated LTEE in ammonium-limited chemostats selects for adaptive mutations in GAT1. (a) LTEE design. Three chemostat vessels w ere founded with a clonal ancestral population and maintained under constant dilution with defined media containing 0.4 mM (NH 4) 2 SO 4 , (0.8mM nitrogen). Chemostats were maintained in continuous mode for 250 generations (~ 3 months) and samples obtained every 10-20 generations for archiving. (b) Dynamics of population fitness. The rate of fitness improvement decelerates over time for three independently replicated LTEE (R1, R2 and R3). Error bar are 95% CI of linear regression analysis of competition assays, which comprised six time points each. (c) Allele dynamics in parallel LTEE. Whole population while genome sequencing was performed on samples from the three LTEEs at 50, 100 and 250 generations to identify high frequency mutations (> ~10%) using an Illumina HiSeq2500 in 2 x 50 bp paired end mode with an average read depth of ~50X. The frequency of the MEP2 amplification was defined as the proportion of clones bearing more than 2 copies of MEP2 among 96 randomly selected clones. GAT1 (red lines) variants are a primary target in the earliest generations of selection but, in some LTEE, are ultimately replaced by other alleles including CNVs that encompass MEP2 (blue lines) and mutations in genes that control cell cycle and growth. x- and y-axes represent time in generation and AF (allele frequency) in %, respectively. (d) Dynamics of minor frequency mutations. 12 genes that have previously been identified as adaptive targets of selection in different nitrogen-limited environments (see method) were subjected to targeted deep sequencing. Multiple missense mutations in GAT1 are present simultaneously in each population and compete with each other during the earliest generations. Discrepancies in the estimated AFs of the same mutations identified in Figure 1c are likely due to noise in the sequencing assay. x- and y-axes represent time in generation and AF (allele frequency) in %, respectively (e) Mutational landscape of adaptive GAT1 mutations. All mutations in GAT1 with population AF greater than 1% are shown. The DNA binding domain of GAT1 is a mutational hotspot in all ammonium-limited LTEE. Multiple missense (protein coding alteration) mutations were observed but no nonsense or frame-shift mutations were detected. (f), The DNA binding domain of GAT1 is under purifying selection in the wild. dN and dS values (see method for their definition) for GAT1 at each amino acid position were calculated using SNAP v2.1.1 (http://www.hiv.lanl.gov/content/sequence/SNAP/SNAP.html) Korber, 2000 using sequences from 42 different wild yeast strains. Unlike LTEE in ammonium-limited chemostats, the GAT1 DNA binding domain is under purifying selection implying that non-synonymous mutations are likely to be detrimental in dynamic environments. Recently, lineage tracking during LTEE in large populations has shown that many independently derived beneficial alleles are present at low frequencies and unlikely to be detected using whole genome, whole population sequencing (Levy et al., 2015). Therefore, we investigated whether additional low frequency mutations of GAT1 were present in evolving populations using targeted deep sequencing (Figure 1d and Supplementary file 1A; see Materials and methods). Each of the evolving populations contained multiple different GAT1 mutations at frequencies of 10−2-10−3. These GAT1 alleles reach their highest frequencies during the early stages of adaptive evolution before lineages containing MEP2 CNVs ultimately rise to high frequency in each population. Importantly, all identified GAT1 mutations are missense mutations in its DNA binding domain (Figure 1e), which we find is under strong purifying selection in natural environments (Figure 1f). To study the functional basis of adaptive GAT1 mutations, we isolated clones with three individual alleles from distinct evolved lineages – gat1-1 (W321L), gat1-2 (C331Y), and gat1-3 (R345G) – (Figure 2a) using backcrossing and allele specific PCR genotyping (Hong and Gresham, 2014). Using competition assays (see Materials and methods), we determined the fitness of the evolved lineages that contain GAT1 mutations plus an additional 3–4 variants in other genes acquired during LTEE. These variants include two MEP2 alleles that we previously identified as reversions of a lab acquired mutation in the transmembrane domain of MEP2 (Hong and Gresham, 2014). We also quantified the fitness of the GAT1 mutations alone, in different nitrogen-limiting conditions – ammonium, glutamine, proline and urea – using chemostats and rich media (YPD) batch condition. All strains containing GAT1 missense mutations are significantly increased in fitness in ammonium-limited chemostats, but exhibit decreased fitness in all other nitrogen-limited conditions consistent with antagonistic pleiotropy (Figure 2b). By contrast, a GAT1 knock out (KO) strain exhibits a fitness defect in both ammonium and proline limited chemostats. GAT1 mutations are nearly neutral in YPD batch media conditions in which GAT1, and the entire NCR regulon, is transcriptionally repressed. Collectively, these results suggest that missense mutations in the DNA binding domain of GAT1 acquired during LTEE alter its function rather than rendering it non-functional. Adaptive GAT1 mutations underlie increased fitness and confer antagonistic pleiotropy. (a) 3D structure model of GAT1 DNA binding domain. The 3D structure is based on available GATA factor DNA binding domain structures in the modbase database (https://modbase.compbio.ucsf.edu/). Adaptive amino acid changes selected for the subsequent analyses lie within, or in close proximity, to the DNA binding domain of GAT1. (b) Fitness effects of GAT1 mutations. GAT1 variants are beneficial in ammonium-limited chemostats and confer increased fitness in the lineages in which they occur. GAT1 variants confer a fitness cost in non-ammonium limited environments consistent with antagonistic pleiotropy. Error bars represent 95% CI of linear regression analysis of competitive fitness assays. ‘*’ denotes the absence of a 95% CI estimate due to a small number of time points sampled in the fitness assay (<5). (YPD: YPD batch culture, AS: Ammonium sulfate-limited chemostat, Gln: Glutamine-limited chemostat, Pro: Proline-limited chemostat, Urea: Urea-limited chemostat; all nitrogen-limited media were normalized to 0.8mM nitrogen). Increased gene expression of nutrient transporters through gene amplification is a prevalent means of increasing fitness in nutrient-limited chemostats (Hong and Gresham, 2014). We asked whether the effects of beneficial GAT1 mutations are mediated by their impact on MEP2 regulation and therefore represent an alternate class of adaptive mutations with the same functional effect of increased transporter expression. To test the importance of MEP2 for the increased fitness associated with GAT1 variants we deleted either the ORF or the promoter region (1 kb upstream of the ORF) of MEP2 in the background of the gat1-1 and gat1-3 alleles and tested their fitness in ammonium-limited chemostats. All strains had severely reduced fitness (Figure 2—figure supplement 1a) consistent with the beneficial effect of GAT1 variants being dependent, at least in part, on MEP2 expression. We also isolated evolved lineages with increased copy numbers of MEP2 from each of the three LTEEs and quantified MEP2 copy number, expression level and relative fitness in ammonium-limited conditions (Figure 2—figure supplement 1b). Increased copy number of MEP2 correlates with increased mRNA expression and results in fitness increases (s > 1.3) greater than that conferred by GAT1 variants (Figure 2b). The detection of lineages with increased fitness and increased expression of MEP2 resulting from CNVs is consistent with fitness increases in GAT1 variant lineages being attributable to their effect on MEP2 expression. We investigated the effect of adaptive missense mutations in GAT1 on gene expression. We performed RNA-seq using three strains that contain one of each of the three adaptive GAT1 mutations alone cultured in ammonium-limited chemostats. We compared expression profiles of GAT1 adaptive mutations with those in the corresponding evolved lineages from which the mutations were isolated (Hong and Gresham, 2014). We found significant divergence of NCR gene expression in all tested strains (Figure 3a and Supplementary file 1B). GAT1 mutations result in increased expression of genes encoding ammonium transporters (MEP1, MEP2, and MEP3) as well as transporters that import other nitrogen sources such as urea, allantoin and GABA. The evolved lineages, which contain GAT1 mutations as well as additional mutations, show more ‘fine-tuned’ gene expression in which only ammonium permease-encoding genes are increased in expression while other NCR targets, which are likely to be irrelevant when ammonium is the only nitrogen source, are repressed. By contrast, GAT1 mutations result in a strong reduction in DAL80 expression. The expression of GLN3 and GZF3 is unchanged in the presence of GAT1 variants (Supplementary file 1B) suggesting that the altered expression of MEP2 and DAL80 is attributable to changes in GAT1 binding affinity. Interestingly, GAT1 variants also result in increased expression of GAT1 itself. Adaptive GAT1 variants exhibit differential effects on target gene expression. (a) Gene expression profile of NCR genes in different GAT1 variant lineages. ‘Blue’ gene names indicate permease-encoding genes for different nitrogen sources. Clustered gene expression values relative to the ancestral strain (log2 transformed fold change compared to the ancestor without statistical filtering) are shown for 41 experimentally confirmed NCR target genes. Expression data for the final evolved population and two lineages containing multiple mutations in addition to GAT1 variants from our previous report (Hong and Gresham, 2014) are also presented for reference. (b) Transcriptional reporter assay for MEP2 and DAL80. We quantified GFP expression from the MEP2 and DAL80 promoters in the ancestral and GAT1 variant backgrounds in different nitrogen-limited conditions. In nitrogen-limited chemostats containing different individual sources of nitrogen (ammonium, glutamine, proline and urea), all mutant strains (gat1-1, gat1-2 and gat1-3) show the same gene expression pattern for DAL80 (decreased expression) and MEP2 (increased expression) compared to the ancestral genotype. A GAT1 KO mutant results in decreased expression of both DAL80 and MEP2. (c) GFP reporter assay for MEP2 and DAL80 promoters in heterozygous diploids. The gat1-1/GAT1 genotype results in expression of DAL80 or MEP2 comparable to the ancestral strain. The distribution and median expression (dashed line) for each genotype is shown. To further quantify changes in transcriptional activity attributable to GAT1 variants, we fused the promoter sequences of four targets of GAT1 (GAP1, MEP2, GZF3 and DAL80) to the coding sequence of GFP in the backgrounds of the ancestral (WT), KO (gat1Δ0), and the three GAT1 variants (gat1-1, gat1-2 and gat1-3) (Figure 3—figure supplement 1a). GFP expression levels measured using this assay were highly comparable to RNA-seq data (Figure 3—figure supplement 1b) and therefore a good proxy of transcriptional activation of each promoter in the background of the different GAT1 variants (Figure 3—figure supplement 1c). We found significant differences in transcriptional activities between GAT1 variants at MEP2 and DAL80 promoters in nitrogen-limited (both ammonium and proline) conditions (Figure 3b and Supplementary file 1C). All adaptive GAT1 mutations result in strongly reduced DAL80 expression and increased MEP2 expression compared to the wild type, while a GAT1 KO strain showed slightly reduced DAL80 expression and decreased MEP2 expression. This result is consistent with our RNA-seq analysis and provides additional evidence that the beneficial missense mutations in the DNA binding domain of GAT1 do not render it non-functional. We also tested whether these mutations are dominant or recessive using diploid strains heterozygous for adaptive GAT1 mutations (e.g. gat1-1/GAT1) (Figure 3c). DAL80 and MEP2 promoter activities in these heterozygotes were identical to the haploid ancestral strain (FY4) containing a wildtype GAT1 allele indicating that the missense mutations of GAT1 are recessive and therefore unlikely to have gain-of-function or dominant negative effects. The maintenance, but reduced, expression of DAL80 and MEP2 in the GAT1 KO background (Figure 3b) is due to the activity of GLN3 as a gat1 gln3 double KO results in no expression from the DAL80 and MEP2 promoters (Figure 3—figure supplement 2). GLN3 is required for expression of MEP2 in the presence of GAT1 variants (Figure 3—figure supplement 2), likely due to its role in activating the entire NCR regulon, but in these strains the expression of GLN3 is not increased and therefore does not contribute to the increased steady-state expression of MEP2. To test whether adaptive GAT1 mutations have acquired new binding specificities we used protein binding microarrays (PBMs) to assay the DNA binding domains of adaptive GAT1 alleles (gat1-1 and gat1-3) as well as the ancestral GAT1 allele. Whereas the ancestral GAT1 DNA binding domain shows clear evidence of specificity for the GATAA consensus sequence, adaptive GAT1 alleles failed to show evidence for any significant binding specificity using PBMs (Supplementary file 2A) indicating that their functional and fitness effects are not exerted by the acquisition of new DNA binding specificities. We quantified alterations in the affinity of the adaptive GAT1 alleles for their target DNA sequences using electrophoretic mobility shift assays (EMSAs) (Figure 4a, Supplementary file 2B and S6). We studied the binding of adaptive GAT1 TF to the promoter sequences of MEP2 and DAL80, which showed discrepant effects on gene expression in the presence of adaptive GAT1 alleles: increased expression in the case of MEP2 and decreased expression in the case of DAL80 (Figure 3a and Figure 3b). MEP2 contains two distinct GATAA sequence motifs in its promoter region whereas DAL80 possesses only one. Adaptive GAT1 variants showed significantly decreased binding affinity to all target motifs (Figure 4b). Binding kinetics calculated based on a two parameter Michaelis-Menten model (Stormo and Zhao, 2010) show that adaptive GAT1 mutations have a more detrimental effect on binding to the DAL80 promoter GATAA site compared with the two MEP2 promoter binding sites likely reflecting differences in motif strength (Figure 4c and Supplementary file 1D). This suggests that the adaptive GAT1 alleles encode functional TFs that maintain sequence specificity for GATAA binding sites, but exhibit a quantitative decrease in affinity for their target sites compared to the ancestral allele. Whereas reduced affinity of GAT1 variants for the comparatively weak promoter of DAL80 results in its reduced expression, expression from the comparatively strong MEP2 promoter is increased in the presence of GAT1 variants despite a reduction in affinity for GATAA sites in the MEP2 promoter. Consistent with a differential effect of reduced GAT1 binding affinity on different promoters, we identified a significant positive correlation between gene expression levels of NCR genes and the estimated affinity of each promoter for GAT1 (Figure 4d). Adaptive GAT1 variants alter DNA binding affinities in a promoter-specific manner. (a) Design of protein-DNA binding assays. We purified a 151-amino acid long protein fragments of GAT1 containing the DNA binding domain (DBD) (positions 310–349) for the ancestral GAT1 and two adaptive mutations – gat1-1 (W321L) and gat1-3 (R345G). DNA sequences containing the consensus sequence in MEP2 and DAL80 promoters were determined from the MotifDb collection in Bioconductor. MEP2 motif 1 contains three copies of GATAA, MEP2 motif 2 contains two copies of GATAA and DAL80 motif 1 contains one copy of GATAA. (b) Electrophoretic mobility shift assay (EMSA) analysis of GAT1 variants. Increasing quantities of the GAT1 DBD protein fragment from 0 to 20 μg were added to 32P-labeled dsDNA. Arrows and stars indicate protein-bound DNA and unbound DNA respectively. Negative motif sequences (neg) were prepared by randomizing bases only at their GATAA binding motif sequences (see Supplementary file 2B). (c) Proportion of bound DNA for different amounts of protein. The two GAT1 variants showed significantly decreased binding affinity to all three GATAA motifs. Dotted lines are fits to a two-parameter Michaelis-Menten model. Only ancestral GAT1 and gat1-3 (R345G) showed significant estimates of two parameters (Frmax and Kx) (p-value<0.02). Insignificant estimates for gat1-1 (W321L) may be due to the small number of data points (Supplementary file 2C). (d) Correlation between GAT1 promoter affinity and expression changes for NCR target genes. The promoter affinity for GAT1 (Lee and Bussemaker, 2010) is positively correlated (Spearman correlation = 0.31; p-value=0.02) with the alteration in expression of NCR targets in strains containing adaptive GAT1 mutations (log2 transformed fold change of gene expression of NCR genes in GAT1 variant strains compared to the ancestor strain). (e) Model for altered output from the NCR regulatory network by adaptive GAT1 mutations. GAT1 mutations reduce affinity for the promoter of MEP2, but have an even greater reduction in affinity for the promoter of the repressor, DAL80. (f) Mathematical modeling of GAT1 affinity for MEP2 and DAL80 promoters on steady-state MEP2 expression. The steady state expression level of MEP2 depends on both the absolute activation of the MEP2 promoter (indicated with increasing levels of blue) and DAL80 promoter and the ratio of their levels of activation (x-axis). MEP2 expression relative to an ancestral state (green point) is increased by adaptive GAT1 variants that result in a quantitative decrease in direct activation of MEP2 and a proportionally greater decrease in direct activation of DAL80 (parameter space resulting in increased MEP2 expression outlined by red triangle). As shown in the inset, an ancestral state in which MEP2 promoter activation (red) is greater than DAL80 promoter activation (pink) can evolve to a state in which both promoters are decreased in activation, but the decrease is more pronounced at the DAL80 promoter. Interestingly, GAT1-1 (W321L) shows a much stronger reduction in DNA binding affinity compared to GAT1-3 (R345G) for both tested promoter sequences (Figure 4b and c). Two pieces of evidence suggest this difference may have important functional effects. First, we find that the residue (R345) altered in the GAT1-3 allele is the most frequently mutated site in multiple LTEEs whereas only a single variant was identified at the site mutated in the GAT1-1 allele (W321) (Figure 1e). Second, the GAT1-3 variant results in higher relative fitness compared to the GAT1-1 variant (Figure 2b). These observations suggest that intermediate reductions in GAT1 binding affinity may be more beneficial than strongly reduced binding. Consistent with this claim, complete loss of GAT1 results in decreased MEP2 expression (Figure 3b) and is deleterious (Figure 2b). Using functional assays, we found that the impact of GAT1 variants on promoter binding affinities differs between the DAL80 and MEP2 promoters. 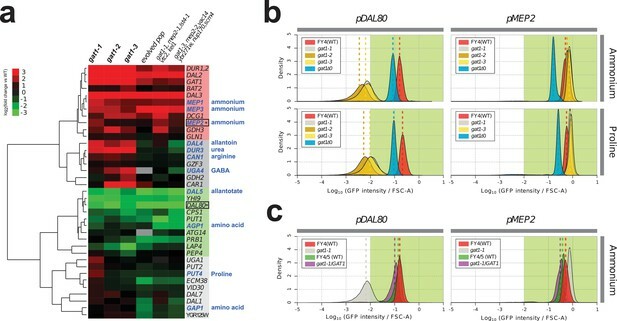 As DAL80 is a negative regulator of MEP2, a quantitative decrease in DAL80 expression is expected to result in increased expression from the MEP2 promoter. However, GAT1 variants also reduce affinity for the MEP2 promoter sequence potentially decreasing its direct activation. Thus, while the overall topology of the GAT1-DAL80-MEP2 I1-FFL is maintained in evolved lineages, the increase in MEP2 expression, and likely other targets with strong promoters (including GAT1 itself), must be mediated by maintenance of direct binding at the MEP2 promoter and an indirect effect through reduced activation of the repressor, DAL80 (Figure 4e). Using a mathematical model of I1-FFLs we confirmed that a net increase in MEP2 expression results when decreased activation at the DAL80 promoter is the only functional effect of GAT1 variation (Figure 4f). However, using this model we also find that a GAT1 variant that results in a decrease in direct activation of the MEP2 promoter will result in increased expression of MEP2 when activation of the DAL80 promoter is also decreased. Increased MEP2 expression, despite decreased activation of the MEP2 promoter, is enhanced by a greater relative decrease in DAL80 activation. Thus, our model of a I1-FFL is consistent with the finding that decreased binding affinity of GAT1, leading to decreased activation of both the DAL80 and MEP2 promoters (Figure 4b and Figure 4c) can simultaneously result in decreased expression of the repressor, DAL80 and increased expression of the target gene, MEP2 (Figure 3a and Figure 3b). Using RNA-seq, we also find that the expression of GAT1 is increased as a result of GAT1 variants (Figure 3a). As GAT1 activates its own expression and is also repressed by DAL80, increased expression of GAT1 is likely due to the same phenomenon that results in increased MEP2 expression. The increase in GAT1 expression likely also contributes to increased MEP2 expression, as modeling an increase in GAT1 expression results in increased MEP2 expression (Figure 4—figure supplement 1). Here, we describe the evolution of a gene regulatory network in real time and dissection of the functional basis of adaptive changes in transcription factor binding affinity. We find that missense mutations in GAT1 are under strong positive selection in populations evolving in a constant ammonium-limited environment. The functional effects of adaptive GAT1 mutations are the result of increasing the output from an I1-FFL, one of the most frequently occurring network motifs in transcriptional networks, by reducing the binding affinity of the activator, GAT1. The functional effect of adaptive GAT1 variation is mediated by increased expression of a high affinity ammonium transporter that results in increased fitness in the ammonium-limited environment. To date, genetic diversity and the dynamics of evolving lineages during LTEE has been largely explored using whole population whole genome sequencing (Hong and Gresham, 2014; Lang et al., 2013; Kvitek et al., 2013). However, the development of high-resolution lineage tracking using random molecular barcodes revealed that a multitude of lineages with increased fitness compete during the early stages of adaptive evolution, but are subsequently outcompeted by a small number of lineages carrying high-fitness mutations that occur early in the populations’ histories (Levy et al., 2015). Consistent with this observation, we find that targeted deep sequencing of evolving populations identified many GAT1 mutations in evolving populations that are under positive selection, but never increase to population frequencies greater than 1%. These beneficial mutations are not detected by population-level sequencing. Thus, defining the complete spectrum of adaptive mutations in evolving populations requires methods for detecting low frequency mutations that are beneficial but do not persist in the population. This is currently most feasible using the approach we adapted in this study: LTEE in defined environments and ultra-deep sequencing of loci that are known, or suspected, to harbor adaptive variation. The transcriptional output from a promoter is a function of the strength of the promoter, which depends on the identity and number of cis regulatory elements, and the affinity of a transcription factor for those elements. Promoters are bound by both activating and repressing transcription factors and the relative activities of these trans factors coordinately controls the amount of expression from a given promoter. Here, we have shown that decreasing the binding affinity of GAT1 for its target sequence increases expression output from the MEP2 promoter as well as other GAT1 targets with strong promoters. 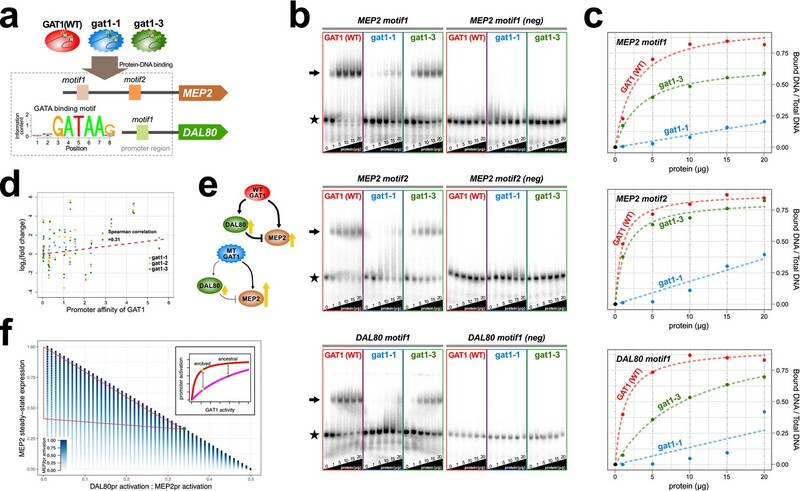 We attribute the increase in MEP2 expression to decreased affinity of GAT1 for its consensus sequence, which reduces transcriptional output from the DAL80 promoter, a comparatively weak promoter. A reduction in the effective concentration of the repressor results in increased transcriptional output from the MEP2 promoter. Surprisingly, we also observe reduced affinity of GAT1 variants for the MEP2 promoter, which one would expect might reduce its transcriptional output. However, as illustrated by our model (Figure 4f), a proportionally greater decrease in DAL80 expression can outweigh the effect of reduced activation of the MEP2 promoter. GAT1 is auto-regulatory and we observe that GAT1 variants also result in increased GAT1 expression, which further increases expression output from the MEP2 promoter (Figure 4—figure supplement 2). Thus, quantitatively different effects of transcription factor variants on promoters of differing strengths, in the context of gene regulatory architectures, can lead to counterintuitive impacts on gene expression. In our repeated LTEE we detected multiple GAT1 mutations during the first ~100 generations of selection in ammonium limitation. 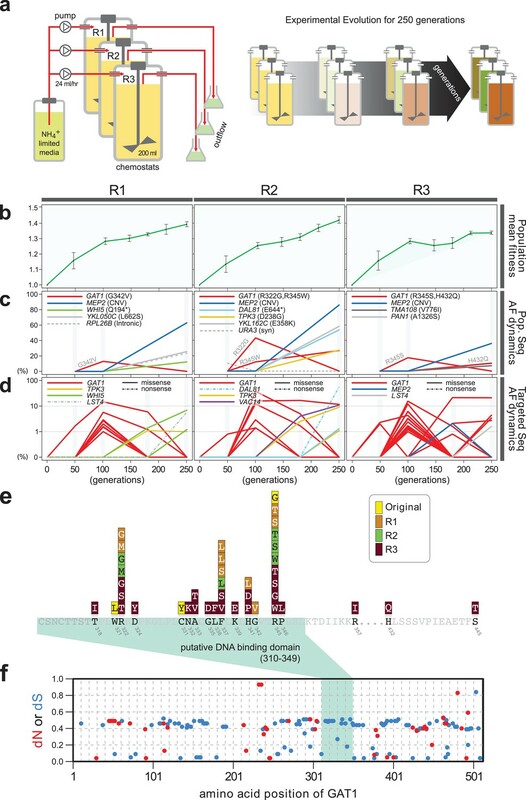 The preponderance of these mutations within and between populations suggests that remodeling the GAT1-DAL80-MEP2 I1-FFL is a frequently occurring repeatable mode of adaptive evolution during the earliest stages of adaptive evolution in ammonium-limited environments. However, adaptive GAT1 alleles likely do not represent a fitness optimum in the ammonium-limited environment as, in contrast to our previous study (Hong and Gresham, 2014), we found that ultimately these alleles were outcompeted by lineages containing MEP2 amplifications. MEP2 amplifications have the same functional effect as adaptive GAT1 mutations: they increase expression of MEP2 enabling improved ammonium transport capabilities. However, the increased expression of other high affinity transporters in GAT1 lineages that are unable to transport ammonium may confer a fitness cost that is not associated with MEP2 amplification alleles. It should be noted that our method for detecting MEP2 amplifications has limited detection power until CNVs rise to high frequencies in the population. Thus, it is likely that MEP2 amplification alleles co-exist with adaptive GAT1 mutations during the early phases of evolution but are undetectable using our sampling and assay scheme. Our results provide insight into NCR regulation and suggest additional levels of regulatory complexity. First, it is notable that we do not detect DAL80 loss of function alleles in our LTEE. Given the current model of NCR regulation, loss of the repressor DAL80 would be expected to result in increased expression of MEP2 and other NCR regulated genes resulting in increased fitness. Similarly, we do not see selection for variation in the other NCR repressor, GZF3. Finally, GLN3, the upstream activator of NCR genes, which is itself not a target of NCR regulation does not appear to harbor any adaptive variation. Combining LTEE with targeted studies of functional and fitness effects of regulatory components of NCR may provide further insights into how these four GATA factors coordinately regulate the NCR regulon. Experimental evolution in eukaryotic microbes has many parallels with the molecular processes, and evolutionary dynamics, underlying tumorigenesis. The evolutionary hotspot in the DNA binding domain of GAT1 identified in this study is reminiscent of hotspots in transcriptional regulators important in tumorigenesis including recurrent missense mutations in the DNA binding domain of TP53, a driver in the majority of human cancers (Freed-Pastor and Prives, 2012), and CTCF, a poly-zinc finger transcription factor regulating oncogenes and tumor suppressor genes (Ong and Corces, 2014). As with adaptive evolution, missense mutations in the DNA binding domain of these transcription factors result in altered binding affinities at the promoters of target genes resulting in aberrant transcriptional activation in various cancers (Park et al., 1994; Inga et al., 2001; Filippova et al., 2002). Understanding the gene regulatory architecture of transcription factors that play important roles in human cancers will undoubtedly contribute to understanding the functional effect of oncogenic variation. The study of evolutionary processes using LTEE enables testing the dynamics, outcome and functional basis of adaptive evolution. Selection in chemostats provides the benefit of defined selective conditions and testable hypotheses regarding the functional basis of increased fitness (Gresham and Hong, 2015; Gresham and Dunham, 2014). Our study highlights the importance of network motifs and incorporation of biophysical parameters in gene regulatory models in order to predict their functional output in the context of evolution. As I1-FFL are one of the most frequent motifs in transcriptional networks they may serve a general evolutionary role as facilitators of transcriptional tuning through modulation of transcriptional factor binding affinities. Further work is required to determine whether the properties of I1-FFL afford this motif unique evolutionary potential. The ancestral strain used for all LTEE is a prototrophic haploid derivative (FY4; MATa) of the S288c reference strain. To isolate individual GAT1 mutations, we crossed each evolved lineage to an isogenic haploid strain of the opposite mating type (FY5; MATα) and, following sporulation, recovered meiotic products bearing different combinations of derived adaptive alleles. To genotype individual segregants, we used allele-specific PCR for which two allele specific forward primers and one common reverse primer were prepared. We also knocked out the entire GAT1 locus by replacing it with nourseothricin resistance (NatR) marker using a standard high efficiency transformation protocol. We engineered GFP fused promoter constructs for four GAT1 targets (GAP1, MEP2, DAL80 and GZF3) and integrated them at the HO locus using homology based transformation (Figure 3—figure supplement 1). For each construct, we fused GFP with 1 kb of sequence 5’ and 1 kb of sequence 3’ of the open reading frame (ORF) for each target gene, which encompasses regulatory elements including promoter and UTRs. We attempted to construct a GFP-based transcriptional reporter using the GAT1 promoter but found that including as much as 2 kb of sequence 5’ to the GAT1 ORF failed to activate GFP expression in either ancestral or adaptive GAT1 backgrounds (data not shown). We also knocked out the MEP2 ORF and 1 kb of sequence upstream of the MEP2 ORF in the background of the ancestral strain as well as two strains bearing single GAT1 missense mutations (gat1-1 and gat1-3) using the same transformation protocol. We constructed diploid strains that are heterozygous at the GAT1 locus by mating the GFP reporter constructs in the ancestral background and three GAT1 mutant backgrounds to an isogenic strain of the opposite mating type (FY5). All constructed strains were verified using Sanger sequencing. All medium conditions and recipes were identical with those used in our previous study (Hong and Gresham, 2014): all nitrogen-limited media contained 0.8 mM of nitrogen regardless of the molecular form. All conditions for replaying LTEEs in chemostats were identical to those described in our previous study (Hong and Gresham, 2014). The dilution rate (0.12 hr−1) of the chemostat was checked every one or two days over the 250 generation (~3 months) duration of the LTEEs, and intermediate samples of each population were archived every 20 generations. We confirmed that the steady-state cell density of ~3 × 107 cells/mL was consistently maintained in the 200 mL cultures over the entire LTEE. We performed whole genome sequencing of entire populations at 50, 100 and 250 generations for all LTEE cultures. Sequencing library preparation was performed using the Illumina TruSeq library preparation protocol as previously described (Hong and Gresham, 2014). We used 2 × 50 bp paired end mode on a HiSeq 2500 and all fastq files were processed using bwa (Li and Durbin, 2009), samtools (Li et al., 2009), and SNVer (Wei et al., 2011) to generate a list of mutations with significant allele frequencies in each population. The average sequence read coverage was around 50x, resulting in a detection limit for SNPs around 10% (i.e. we required that each variant was present in at least five reads). We identified CNVs by normalizing read depth at each nucleotide position to the median read depth of the entire genome by processing BAM files using samtools and R. We identified CNVs that include MEP2 in all three populations at 250 generations using read depth analysis. At each time point during the LTEE, we estimated the allele frequency of CNVs in the population by randomly selecting 96 clones and conducting qPCR to measure the copy number of MEP2 for all clones. We found that most clones possess one or two copies of MEP2 but some possesses up to eight or nine copies (data not shown). All clones containing two of more copies of MEP2 were aggregated within each population for allele frequency estimates of CNVs. We performed targeted deep sequencing for 12 loci: GAT1, MEP2, LST4, VAC14, RIM15, YBR271W, RPL26B, YKL050C, WHI5, DAL81, TPK3 and YKL162C. These loci are either genes that (1) contain high frequency SNPs identified in population sequencing or (2) have been repeatedly identified as containing acquired variants in prior LTEEs in nutrient-limited chemostats. For each locus, we amplified the entire coding sequence plus 1 kb upstream and downstream of the ORF using PCR. We then randomly fragmented PCR products using sonication to a size of ~250 bp and prepared DNA sequencing libraries using the identical protocol used for population sequencing. Amplicon libraries were sequenced using an Illumina MiSeq in a 2 × 250 bp mode such that the two paired reads overlapped and each insert was sequenced twice. Only overlapping regions were used for allele frequency estimation and thereby we were able to dramatically reduce the false positive SNP call rate. For SNP frequency estimation, the average read coverage from amplicon sequencing was ~50,000. Using SNVer, we determined minor allele frequency mutations for all variants present at a frequency of ≥1%. We obtained 42 different GAT1 sequences from multiple yeast isolates that were reported in a previous study (Liti et al., 2009). These include 32 natural isolates collected from multiple geographical locations including Europe, Africa, America, Asia and Oceania, and 10 domesticated isolates from sake or wine fermentations. dN and dS represent the proportion of observed nonsynonymous substitutions among all potential nonsynonymous substitutions and the proportion of observed synonymous substitutions among all potential synonymous substitutions, respectively. Actual values for each amino acid position were calculated from SNAP v2.1.1 (http://www.hiv.lanl.gov/content/sequence/SNAP/ SNAP.html)(Korber, 2000). The ModBase model of yeast GAT1 (UniProt P43574) from an NMR structure (PDB 4GAT) complexed with Zn and DNA, with a nearly identical fold to a high-resolution crystal structure (PDB 2VUS), is the best model available. The 3D image was visualized by Polyview-3D (http://polyview.cchmc.org/polyview3d.html). Competition assays were performed as in (Hong and Gresham, 2014). We used a mCitrine-labeled ancestral (FY4) strain (DGY500, see Supplementary file 1E) for all competition assays. For population-level fitness assay, we established cultures containing the ancestral mCitirine-labeled strain (DGY500) alongside chemostats vessels in which LTEE were performed and let them reach the steady state conditions at the same dilution rate. We then mixed a sample from the LTEE with the fluorescence labeled ancestor strain in ratio of 1:9. To determine population fitness, each competing culture was sampled at multiple (5 -10) time points over a total period of less than 20 generations. At least 10,000 cells were assayed using an Accuri flow cytometer to determine the relative abundance of each genotype, and relative fitness determined using linear regression of the natural logarithm of the ratio of the two genotypes against the number of elapsed generations. We tested the fitness of three evolved mutants, three segregants from backcrossing experiments that contained only GAT1 mutations and one engineered GAT1 KO strain in four different nitrogen-limited chemostat conditions – using either ammonium, glutamine, proline or urea – and in YPD rich medium using batch culturing and serial dilution. We also performed fitness assays for MEP2 ORF and promoter deletion strains in the ancestral background, and in the presence of gat1-1 and gat1-3 alleles, and three evolved lineages harboring additional MEP2 gene copy selected from the finally evolved populations, using the same procedures in ammonium-limited chemostats. For the competition assay in YPD rich condition, we sampled twice per day and back-diluted the culture (1/200) into a fresh medium every night for 3 or 4 days. All subsequent analysis steps for clonal fitness determination were the same as population fitness assays. We performed RNA-seq analysis in strains containing one of four different GAT1 alleles (ancestral gat1, gat1-1, gat1-2, gat1-3) and one of three strains different GFP-based transcriptional reporter for either the GAP1, MEP2 or DAL80 promoter (Supplementary file 1E). Each set of experiments using strains that contained the same GAT1 allele, but different transcriptional reporters was treated as biological triplicates as these strains are identical except for the transcriptional reporter. In total, we cultured 12 different chemostat vessels (3 GFP reporters x 4 different GAT1 alleles) and harvested a sample of 10 mL from each culture at steady state using vacuum filtration and snap freezing in liquid nitrogen with subsequent storage at −80°C until further processing. RNA extractions were performed using an acid phenol-chloroform method. For mRNA enrichment, we used poly-A selection and the final yield of selected RNA molecules was around 10–50 ng in total. For cDNA synthesis, we used Superscript III kit (Invitrogen) and dNTPs mixtures for the first strand synthesis and E. coli DNA ligase and polymerase I (Invitrogen) for second strand synthesis with a mixture of dATP, dCTP, dGTP and dUTP. Then, we performed end-repair, A-tailing and adapter ligation based on the standard Illumina TruSeq library preparation protocol. All reaction cleanups between each step were performed using AMPure XP beads (Beckman Coulter, Inc). For directional sequencing of first strand cDNA only, we treated with UNG (Thermo) and amplified the ligated molecules using Phusion high fidelity DNA polymerase (NEB) using 12 or 15 of PCR cycles. Adapter dimers were removed by conducting two rounds of size selection using AMPure XP beads. We confirmed the expected size distribution of ligated molecules using a BioAnalyzer and then quantified library concentrations using qPCR and KAPA Library Quantification kits (KAPA Biosystems). All RNA-seq was performed using an Illumina HiSeq 2500 in a 2 × 50 bp paired end rapid-run mode. We used Tophat (Trapnell et al., 2009) to align sequencing reads to the Saccharomyces cerevisiae S288C reference genome, obtained from SGD on Feb 03, 2011. From the resulting RNA-seq count data, we used edgeR (Robinson et al., 2010) to determine significant differential expression (DE) for all genes compared to the ancestral strain grown in the same conditions (see the final log2 transformed fold change values in Supplementary file 1B). The pearson correlation between promoter affinity for GAT1 and gene expression fold change was calculated for NCR genes only and a p-value was determined using permutation testing by randomly selecting 10,000 gene sets of the same size from all ~6000 yeast genes. All reporter strains were grown in the same chemostat conditions at a dilution rate of 0.12 h−1. Samples were taken at steady state, sonicated, resuspended in PBS buffer, and analyzed using an Accuri flow cytometer. In addition, we tested GFP expression in minimal media batch cultures containing either ammonium, glutamine, or proline as well as YPD batch culture. All GFP intensity values were normalized by forward scatter (FSC-A) and log10 transformed. PBM methods were identical to those described in (Lam et al., 2011; Weirauch et al., 2013). The DNA binding domains of GAT1 (WT) and two mutants (gat1-1 and gat1-3) flanked by 50 amino acids on each side (see protein sequences in Supplementary file 2B) were subcloned into a GST-tag conjugated vector pTH6838 (Supplementary file 1F). Each plasmid was analyzed in duplicate on two different arrays (HK and ME) with differing probe sequences. We used 150 ng of plasmid DNA in a 15 μl in vitro transcription/translation reaction using a PURExpress In Vitro Protein Synthesis Kit (New England BioLabs) supplemented with RNase inhibitor and 50 μM zinc acetate. Calculation of 8-mer Z- and E-scores was performed as previously described (Berger et al., 2006). Microarray data were processed by removing spots flagged as ‘bad’ or ‘suspect’, and employing spatial de-trending (using a 7 × 7 window centered on each spot) as in (Weirauch et al., 2013). Experiments were deemed successful if at least one 8-mer had an E-score >0.45 on both arrays, the complementary arrays produced highly correlated E- and Z-scores, and the complementary arrays yielded similar PWMs based on the PWM_align algorithm, which aligns the top ten 8-mers (based on E-scores), and tallies the frequency at each position to generate a PWM (Weirauch et al., 2013). We solved the system of equations numerically to determine the steady-state levels using the deSolve() package in R (Soetaert et al., 2010). We systematically varied the values of A and X to determine the effect of these parameters on the steady-state expression of MEP2. We set the parameter values of R = 2 and c = 1 and solved the system of equations using initial values of GAT1 = 1, DAL80 = 0, MEP2 = 0. Variation in the parameter values of R and c alters the specific steady-state values, but the overall trend is robust to variation in these parameters. All raw fastq files are available from the NCBI Sequence Read Archive with accession number SRP101365 for whole genome population sequencing of replayed LTEE cultures, SRP101367 for targeted deep sequencing of the same LTEE populations and SRP101370 for RNA-seq data. Molecular and Cellular Biology 27:3065–3086. Cold Spring Harbor Symposia on Quantitative Biology 26:193–211. In: A. G Rodrigo, H Gerald, E Learn, editors. Computational Analysis of HIV Molecular Sequence. Dordrecht, Netherlands: Kluwer Academic Publishers. pp. 55–72. Molecular Biology and Evolution 33:1131–1146. Cold Spring Harbor Symposia on Quantitative Biology 80:265–274. Journal of Statistical Software, 33. The loci of evolution: how predictable is genetic evolution? Thank you for submitting your article "An incoherent feedforward loop facilitates adaptive tuning of gene expression" for consideration by eLife. Your article has been reviewed by three peer reviewers, and the evaluation has been overseen by Naama Barkai as the Senior and Reviewing Editor. The following individual involved in review of your submission has agreed to reveal his identity: Kevin J Verstrepen (Reviewer #3). The authors evolve yeast in nitrogen-limited conditions. They find that cells increase expression of MEP2, the ammonium permease either by increasing the gene copy number (reported before) or through mutations in the MEP2 transcription factor GAT1. Surprisingly, these mutations reduce the binding of Gat1 to the MEP2 promoter, but still increase the expression of MEP2 by decreasing the expression of its repressor DAL80. This is indeed an interesting and surprising discovery that shows how the connectivity of molecular circuits could impact on their ability to evolve. 1) Report expression and fitness for all lineages, as suggested by reviewer #3. 2) Change the model to include auto-regulation of GAT1, as requested below. 3) Discuss the ability to distinguish the contribution of DAL80 vs. GAT1 to the increased MEP2 expression. 4) Discuss the generality of the results. Gresham and colleagues examine the molecular basis of adaptive evolution in an experimental evolution setting. They evolve asexual yeast strains in nitrogen-limited conditions and use whole-genome population sequencing to identify the molecular changes associated with fitness gains. The major target of selection in this context is the expression level of MEP2, coding for an ammonium permease. One of the most advantageous changes at this locus is increase in copy number, which was dissected in previous papers. Other changes that occur are non-synonymous changes in GAT1, a transcription factor positively regulating MEP2. Surprisingly, through functional analyses, the authors show that these amino acid changes reduce the binding of Gat1 to the MEP2 promoter. The decreased binging affinity would contribute to increase the expression of MEP2 by decreasing the expression of DAL80, a repressor of MEP2. This paper appears to be an important contribution because the evolution of gene expression is generally reduced to a very low level of complexity (including in my own work) by characterizing changes as being in cis or trans and as positive or negative. However, transcriptional networks are very complex and network motifs can produce expression levels and patterns that are not necessarily changing in a simple way, at least not in a way that would be expected based for instance on simple changes in TF affinities. The findings presented here are a good example of this and also illustrate the need to consider molecular changes in the context of molecular networks in order to be able to map fitness changes to phenotypes and genotypes. The experiments are well done, the paper is well written and clearly of interest to a large community. - It would be useful to eliminate effects that could come from outside the GAT1-DAL80-MEP2 motif and that could explain why MEP2 expression goes up when Gat1 affinity decreases. The gene expression data produced could be used for this purpose, for instance by showing that other potential MEP2 regulators are not affected in the Gat1 mutant backgrounds. - Third paragraph of Discussion. It would be useful to have a stronger conclusion as to how the increased expression of MEP2 is achieved. The dynamic model constructed maybe useful in terms of supporting one mechanism or the other, for instance self-regulation of Gat1 versus weaker effect of GAT1 mutations on DAL80 than on MEP2. In this paper Hong and colleagues attempt to understand the functional significance of specific adaptive mutations that evolve in yeast under N2 limited chemostat growth. They find that a large number of early adaptive mutations – although not clear what proportion – are missense mutations in one particular TF (GAT1) that acts on multiple genes but in particular is a positive regulator of the N2 transporter. These mutations eventually get outcompeted by the expansion of the transporter itself (MEP2) but the early adaptation is (apparently) dominated by the GAT1 missense mutations. Long story short their argument is that most of the GAT1 are loss (reduction) of function in terms of the binding affinity to the GAT1 binding site but because the downstream targets are regulated through an incoherent FF loop this reduction of binding leads to an increase in expression of MEP2 because the GAT1 mutations decrease the expression of the repressor of MEP2, the TF called DAL80. I was very much prepared to like the paper but was left underwhelmed. The evidence that their model is correct in broad strokes is quite convincing. But they do not seem to be able to link the TF binding to fitness despite having a large number of mutants and do not in any way describe the difference between the two GAT1 mutants they study in great detail. One leads to a much stronger reduction of binding – what does that imply for function? I am also unclear about the overall message. What do they mean by claiming that the incoherent FFL enhances the ability of yeast to adapt? Is it that in this context loss of function mutants in terms of binding that are more common can generate a gain of function phenotype in terms of expression of the key gene? Is this particular to this structure? What about the other properties of this structure – like the ability to generate a pulse of expression? I was left without a clear sense of how generalizable the findings are and what they mean broadly. Without this sense of general importance it is hard for me to see why this paper out to be published in eLife rather than in a more particular molecular biology journal. This study shows that evolution in ammonium-limited chemostats repeatedly selects for modulation of the DNA binding affinity of GAT1, one of the transcription factors controlling nitrogen catabolite repression. Due to it being a part of an incoherent type-1 feedforward loop, this alteration in binding affinity results in an increased expression of MEP2, a high-affinity ammonium transporter. This increase ultimately results in an improved fitness in ammonium-limited conditions. As such, network motifs like feedforward loops might facilitate adaptive tuning of gene expression. This is an elegant study highlighting the importance of network motifs, such as feedforward loops, a nuance often overlooked up until now in the interpretation of experimental evolution data. One of the major strengths of this study is the reproducibility of the experimental evolution, exemplifying that this mechanism of adaptive gene expression tuning might be more general than previously thought. Granted the authors take some of the below-mentioned comments and concerns into account, this study will certainly improve our understanding of the dynamics of evolution. • Something that is not really explored in this study, is the influence of GAT1 mutations on its own expression. The data suggest that its expression is also increased (even more than MEP2). This fact is never mentioned in the interpretation of the data, but it might be very important. It is also not included in the mathematical model, which seems a bit simple. As previously said, the expression of GAT1 also depends on the level of GAT1 itself and even on the expression of DAL80. On the other hand, DAL80 supposedly also influences its own expression, and this is also not included in the model. These are very important parts of the feedforward loop, so in my opinion a better model could be made, more resembling the real structure of a feedforward loop. These facts should also be incorporated in the interpretations and discussions. • The authors suggest several times that the mutation of the DNA-binding domain of GAT1 is a quick way to increase the expression of MEP2 during evolution, before the expression can be increased even more by duplicating MEP2. However, MEP2 expression is never measured in lineages with MEP2 CNVs. As such, the proposed progression of MEP2 expression during evolution is never really shown. As this is one of the main underlying assumptions (increased MEP2 expression equals increased fitness, and CNV has the highest expression), this is a crucial experiment to do. Measure expression and fitness for all lineages, including those with CNVs. Then, correlate this expression with fitness. We have now quantified fitness and expression of lineages containing MEP2 amplification alleles. We show that these lineages have increased fitness relative to those containing GAT1 variants, consistent with the observation that they ultimately outcompete the lineages containing GAT1 variants in our evolution experiments. These new results are presented in Figure 2—figure supplement 1B. We studied the effect of GAT1 autoregulation on our model. Using RNAseq, we observe increased expression of GAT1 in strains containing GAT1 variants. Using our model, we find that increases in GAT1 expression linearly amplify expression of MEP2 and thereby contribute to the increased expression of MEP2. These results are now presented in Figure 4—figure supplement 2. There are four NCR GATA factors: GAT1, DAL80, GLN3 and GZF3. We have added new experiments testing the effect of GLN3 and now more clearly describe the role of each factor and our ability to distinguish their effects. These results are presented in a new Figure 3—figure supplement 2. We have expanded our Discussion regarding the generality of our results. […] I was very much prepared to like the paper but was left underwhelmed. The evidence that their model is correct in broad strokes is quite convincing. But they do not seem to be able to link the TF binding to fitness despite having a large number of mutants and do not in any way describe the difference between the two GAT1 mutants they study in great detail. One leads to a much stronger reduction of binding – what does that imply for function? […] Granted the authors take some of the below-mentioned comments and concerns into account, this study will certainly improve our understanding of the dynamics of evolution. We thank the Genomic Core Facility at New York University Center for Genomics and Systems Biology for DNA sequencing services. We thank members of the Gresham lab and Harmen Bussemaker for helpful discussions. This work was funded by the National Institute of Health (R01GM107466) and the National Science Foundation (MCB1244219). This paper is subject to the NIH Public Access Policy. © 2018, Hong et al.